With Google Buzz still being considered very new, just a little over a month after its introduction, it has been interesting to see users adapt to the new aggregation engine - seeing some use it to pull in their content and others using it as a self-contained blogging platform. Some people see lots of activity on their feeds, while others get significantly less. Now, as we have seen with products like TweetStats for Twitter and a multitude of packages for blog statistics, we now have the first entry (of many, no doubt) aimed at showing your activity on Buzz, and how much traction your feed is getting, along with details on who is commenting, and how much they are saying. The new project, hosted on Google App Engine, authored by Siegfried Hirsch, analyzes your last 100 entries to Buzz, from any source, shows their origin, counts up the words, characters and replies, and displays the people interacting with your feed. As Buzz does not yet have an official API, there is a lot of information hiding from the initial cut, such as the total number of "likes" for your feed, who is liking your content, and any data beyond the first 100 posts. It also does not analyze your own personal activity - trying to find just where you are commenting and liking through your own network (although Google's Dashboard can give you some top-level stats). As I ran the numbers for a number of people on Buzz, from the highly prominent Googler DeWitt Clinton (whose script was the inspiration for this project) to Twitter's John Kalucki, Jesse Stay and myself, it seemed that those who posted natively to Buzz gained the most engagement, while those who piped in activity from third party services - such as Twitter - got less. DeWitt, who has 76 native Buzz entries, saw responses from more than 430 unique authors, with 12 different people (him and myself included) making more than 25 comments on those entries. In contrast, 156 different authors made comments in my last 100 entries, the overwhelming majority of which have been shares from Google Reader. 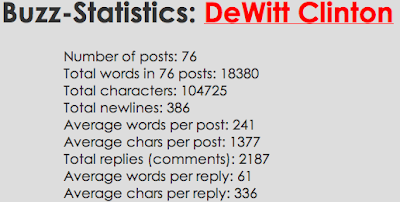 Not unsurprisingly, DeWitt's native entries into Buzz are much longer than my shares, which are often excerpted. 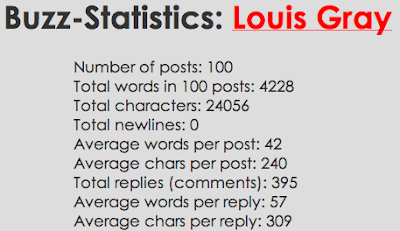 While my 100 posts totaled 4,228 words, the 76 posts he provided were a whopping 18,380 words, or more than 240 apiece. The attention to length resulted in nearly 2,200 comments on his items, with an average of 61 words per reply. The nearly 400 comments I received had a similar 57 words pre reply over the last 100 entries. The Buzz-Statistics engine is billed as version 0.1, and has some work to do. I found it often lagged with larger accounts (my own included), but it's an intriguing first step into getting analytics data out of the new platform. You can check out your data by going to http://buzz-stats.appspot.com/ and entering your Google user ID.